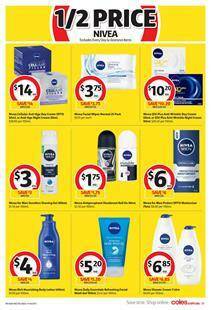 Coles Catalogue has a special corner for the half-price deals on Nivea products including deodorant, wrinkle night creams, facial wipes, shower cream and more. You can find more half prices on many health cares, shampoo, hair colours and dental products in the non-food part of this catalogue. Go to pg 30-31 for Swisse tablets of sleep, magnesium, and wild fish oil. Colgate's mouthwash and toothbrush are also half priced. Coles has special offers in chemical cleaners, laundry products, and more household supplies. Coles prepaid services for mobile phones and some very low price smartphones are also possible to find on pg 36.